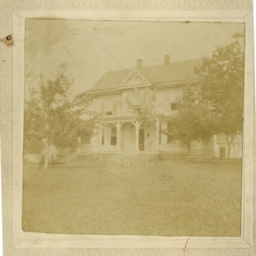 Photographs showing the "Thomas Hudson House" located near Hudsons Crossroads west of Mt. Jackson. 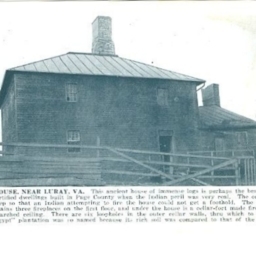 The house was constructed ca. 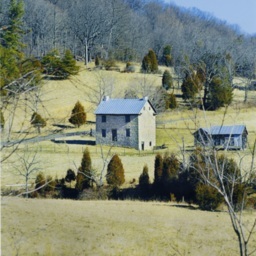 1790 atop a spring and is an excellent example of Germanic stone construction in Shenandoah County. 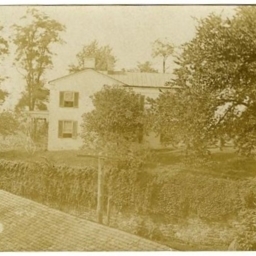 A photograph showing the Magruder House and property on North Main Street in Woodstock Virginia. 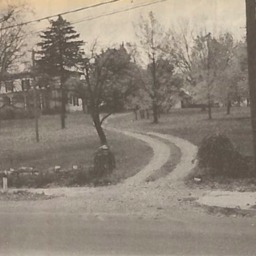 In the 1960s the house was demolished and the land was redeveloped as the Woodstock Shopping Center. 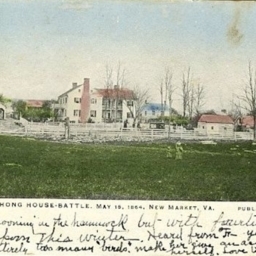 Postcard bearing a colored image of the Bushong House located on the New Market Battlefield. 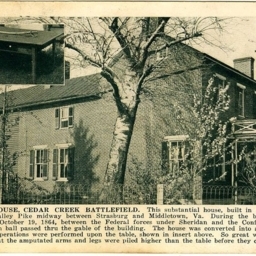 Postcard showing the Bushong house located on the New Market Battlefield. 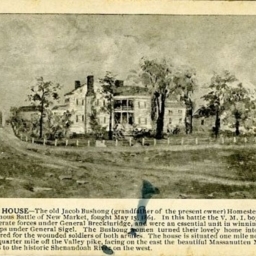 Postcard showing a painting of the Bushong House owned and occupied by Jacob Bushong during the Battle of New Market. 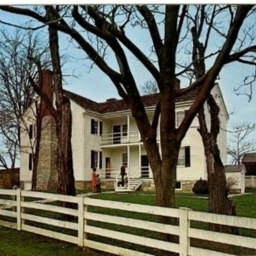 Includes a description of the house, history of the family, and an account of the battle. 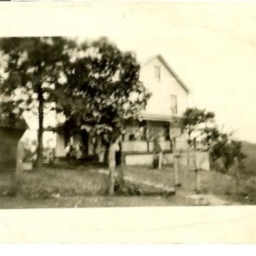 Postcard showing a house somewhere in Shenandoah County. 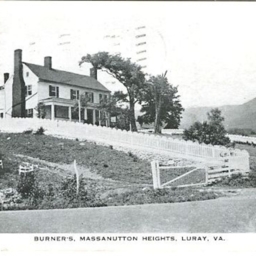 Postcard showing the "Shenstone" House in the southern end of Mt. Jackson. The roof of the covered bridge crossing Mill Creek is visible in the bottom of the photograph. 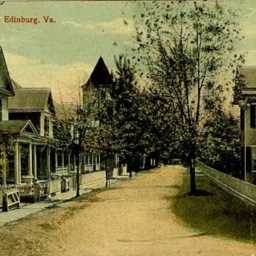 Center Stree, Edinburg , Va.
Color postcard with a photograph of houses along Center Street in Edinburg Virginia. 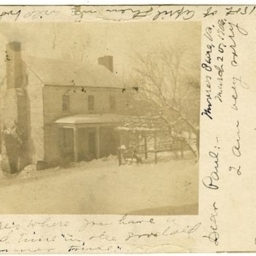 Postcard with a picture of an unidentified house in Shenandoah County Virginia. 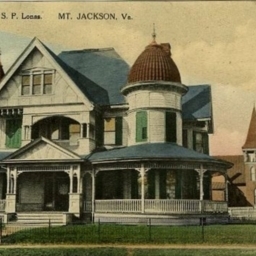 Picture of a house titled "Mountain View" near Woodstock Virginia. 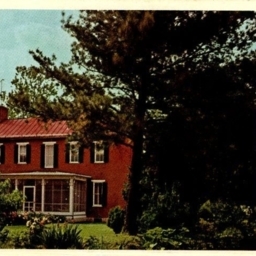 Color postcard with a picture of the Mabel Lee Walton House in Woodstock Virginia. 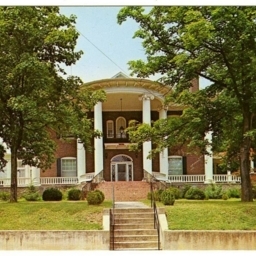 It is the home of the Sigma Sigma Sigma Sosority's National Headquarters. Postcard with a picture of C.L. 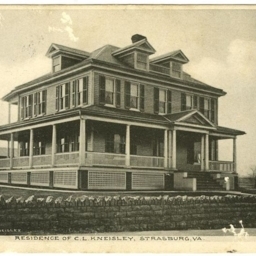 Knisley's residence in Strasburg Virginia.